In the midst of a flood of reveals and announcements surrounding the Mac Pro and iMac, Apple today gave a hint as to what the upcoming Mac Pro will be able to accomplish for high-end, professional users. Although little information was given about the revamped Mac Pro, Phil Schiller described it as the "highest-end" desktop system the company has created yet, and that it will be "designed for our demanding pro customers." TechCrunch asked Craig Federighi, Apple's senior vice president of software engineering, what the boost in the "pro" aspect of the Mac Pro will mean for the company's power users. In response, Federighi mentioned software capabilities in the virtual reality space, as well as tasks centered on high-end cinema production. 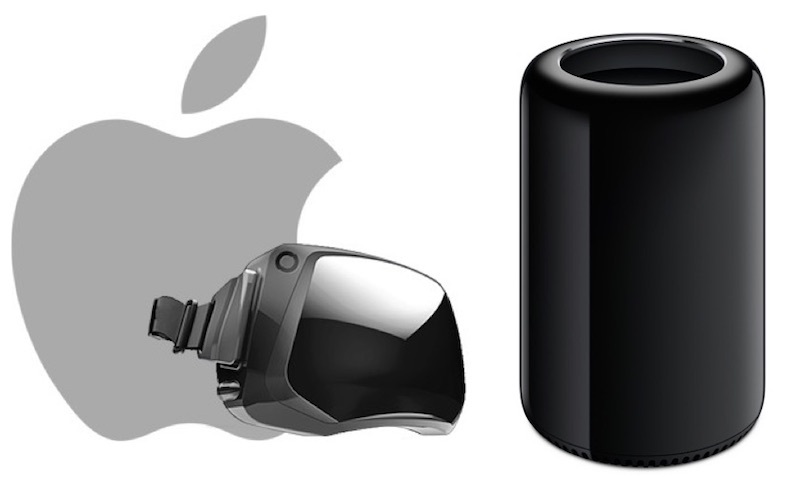 Virtual reality is a noticeable shortcoming of Apple's current Mac Pro line, as well as its iMac desktop computers. Although Federighi doesn't go into any more detail about how VR support might function on the Apple ecosystem -- including which headsets will be supported, and what software will take advantage of VR -- it's an interesting tidbit of information regarding the upcoming Mac Pro line launching sometime after this year. In regards to virtual reality and augmented reality, in recent reports Apple has been more closely aligned with development on the latter technology, which doesn't require a cumbersome headset and can be used with technology already on modern smartphones, as it was in Pokémon Go. Still, specific hardware has been rumored to be in the pipeline by Apple, most recently including an Apple-branded pair of AR glasses that would connect to iPhones and "show images and other information in the wearer's field of vision," but they're predicted to be far from launch. Apple has filed a collection of patents focused on virtual reality headsets that could in theory function with an all-new Mac Pro, but such filings have slowed down in recent years among Apple CEO Tim Cook's well-known preference for AR over VR. Over the past few months, Cook has referred to AR as everything from a "profound" piece of technology that could "amplify" human contact to an idea that could result in a paradigm shift as "huge" as smartphones. Rumors currently suggest that Apple's AR glasses could launch in 2018, but any news regarding an Apple-branded VR headset have been quiet for over a year. As such, it's likely that the upcoming Mac Pro will support third-party VR headsets from companies already in the market. So basically it took Apple almost 4 years to realize the design limitations that were brought up by many people on day 1 of the nMP release. WTF Apple. They are clueless. To some people price is the most important thing, and they don't get that it's NOT the most important thing for most people. Convenience or ease of use is. I could save money by making lunch at home and bring it to work, but fast food is so much more convenient. I could save money by riding my bicycle to work, but buying a car is so much more convenient. I could buy Android tablets for my family, but buying iPads is so much easier as I don't need the support headache from my wife and kids. Oh please. You need to take both into consideration. How useful is the world best and most useful item if you can't even get your hands on it due to cost. The price of the hardware is only part of the equation. Now what I should I do, skip 2017? Hopefully the next iMac will be VR capable, depending on the GPU models they choose. People will just complain about the price of the Mac Pro for VR and cite cheaper Windoze systems capable of running it. This will be true of the Apple monitors too. If they keep using ATI video cards, these things will be dead to the industry on day 1. I sniff the end result of Apple's partnership with NVIDIA being the reason it's going to take until 2018 to get these out the door. That could be. Or it could be that the partnership revolves around Apple taking over the creation of its iOS graphics chips. I do an extensive amount of "prosumer" video and audio work, and I've been really happy with my 2013 Mac Pro. I recently upgraded it to 32 gb RAM and a 1 tb SSD. I have an 8 tb external Thunderbolt drive for my media. The system works great. But the key here, I think, is that I'm "prosumer"; the actual pros are probably looking for something other than my more modest needs. This is one thing that made think the Mac Pro might not be discontinued: I couldn't imagine Apple missing out on VR. It seems like kind of thing they'd be really interested in and it baffled me that they didn't seem to have or be working on a computer that could handle it.